Integrating components to LEAPWORK is easily done using the open REST API, which is exposed on the Controller. In order for the specific component to gain access to LEAPWORK, an API key is required. Any user with an administrator role is able to create and deliver an API key. Go to Settings --> API Access Keys in Studio. 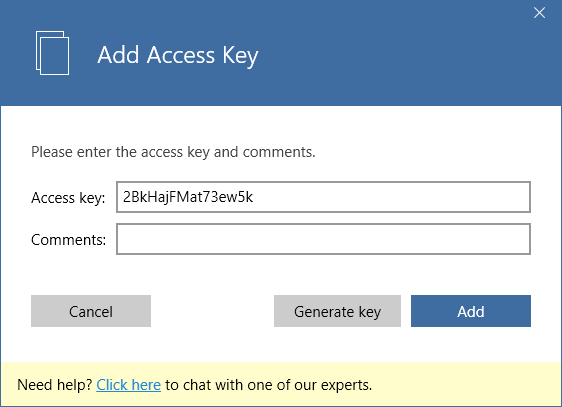 Use the comment field to identify which external component is using the generated key. To complete the task, click Add. This takes you back to the Access keys overview, where you at any given time will be able to see the total number of keys generated by the Controller. Please see the REST API Documentation for more detailed instructions on how to use the REST API and the API Access keys.